Today was Day #6 of Chocolate and Quinoa Theme Week. Today's organically grown, fairly traded, 60% cocoa (minimum) Mini Dark (Noir) bar was another bar from a company with a mission that included socially-driven goals. 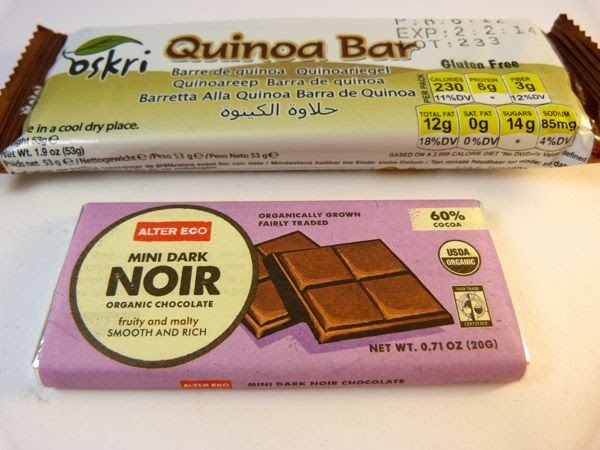 Alter Eco (San Francisco, CA in Americas) is a company that makes chocolate bars, and also sells quinoa, rice and sugar. What's the connection? Alter Eco supports an economic model that includes organic farming, family farms, and production on a "human scale" for all these crops. 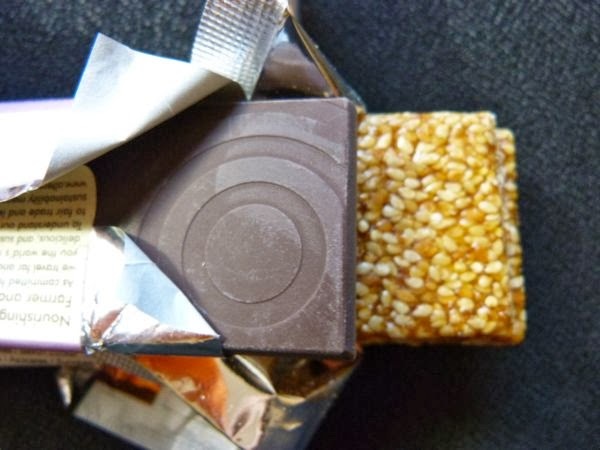 The company's line of chocolate bars included one that contained quinoa. However, I'd already eaten Alter Eco's dark bar with quinoa in the past. 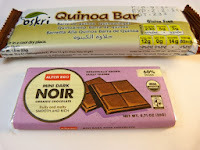 And, since I've been eating a different chocolate every day for the past seven years, I enjoyed the Alter Eco Noir Mini bar with a Gluten Free, crunchy Quinoa Bar (three crispy, thin "bars" in 1 package) from Oskri (Lake Mills, WI), made with rice syrup, sesame seeds, quinoa and date syrup. The bar was described on the label as "fruity and malty" ... "smooth and rich." I thought it had a more uniform "dark" taste, with a very faint glimmer of the flavor notes mentioned.